A school of fresh water fish, which ones can he name? The detailed graphics of colorful fish in these swimshorts is striking, as it is set against a coastal aqua blue background. 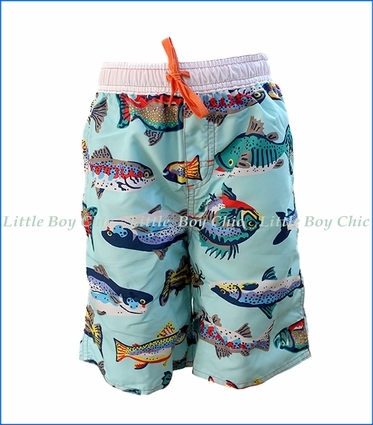 The beautiful color combinations make these swimshorts extraordinary. Pull on with elastic waist. The contrasting drawstring in a pop of orange is as goodlooking as it is useful. Mesh lining. Faux fly.